Comet 67P/CG appears in an image taken by the ROLIS instrument on the Philae lander as it descended from Rosetta spacecraft on Nov. 12, 2014, from a distance of approximately 1.9 miles (3 km) from the surface. 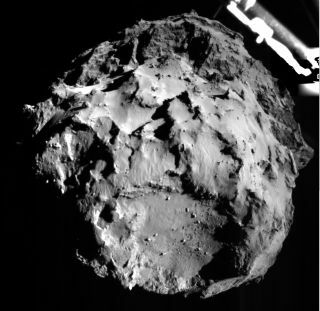 For the first time in history, a spacecraft from Earth has landed on the face of a comet speeding through deep space. The European Space Agency's Philae lander on the Rosetta spacecraft made its nail-biting, history-making touchdown on the Comet 67P/Churyumov-Gerasimenko today (Nov. 12). Mission controllers are still trying to determine whether Philae's harpoons fired to anchor it to the surface of the comet. The landing ended what some scientists had dubbed "seven hours of terror" - the time it took for Philae to descend from Rosetta as the spacecraft and comet flew through space about 317 million miles (510 million kilometers) from Earth. "We see the lander sitting on the road," Andrea Accomazzo, Rosetta flight director said just after landing was confirmed. "We've definitely confirmed that the lander is on the surface." Philae's 10 instruments will monitor Comet 67P/C-G from the surface as Rosetta orbits the comet, investigating it from above. Scientists hope that Philae will continue to collect data about the comet until at least March 2015. The two probes should be able to observe some changes to the comet as it flies closer to the sun. Rosetta is expected to remain with Comet 67P/C-G through December 2015, after it makes its closest flyby to the sun in August 2015. Philae started its difficult descent to the comet's surface at 3:35 a.m. EST (0835 GMT). The probe separated from Rosetta when they were both flying about 14 miles (22.5 kilometers) from the comet's center. The lander deployed a harpoon into the comet just after touchdown in order to keep itself in place in the comet's low gravity. Mission controllers ran into a problem with the 220-pound (100 kilograms) lander during earlier checks of the spacecraft's health. As ESA officials found that the probe's "cold gas thruster" could not be activated. The thruster would have been used to help keep the probe from bouncing off into space after touchdown, so instead, ESA officials decided to totally rely on Philae's harpoon to stick the landing. ESA staff members at ESA's European Space Operations Center in Darmstadt, Germany, celebrate the landing of Philae probe on Comet 67P/Churyumov-Gerasimenko, Nov. 12, 2014. While Philae's landing marks the first time humans have soft-landed a probe on a comet, this is not the first time a spacecraft has visited one of these icy cosmic wanderers. An ESA spacecraft called Giotto flew past Halley's Comet in 1986, and NASA's Stardust mission returned samples of a different comet to Earth in 2006. Scientists also used a probe to impact Comet Tempel 1 in order to learn more about its structure. It has been a long road to the surface of the comet for Philae. The Rosetta mission launched toward Comet 67P/C-G in 2004 and traveled about 4 billion miles through the solar system before reaching the comet in August. Since then, the two spacecraft have been warming up their instruments and preparing for the landing by learning how to fly in orbit around the oddly-shaped comet. This graphic compares the size of Comet 67P/Churyumov–Gerasimenko with the city of London. Comet 67P/C-G's nucleus is very different than mission controllers on Earth though would be. While researchers were expecting to find a semi-round, regularly shaped object, they instead found a strange looking comet with a "body," a "head" and a "neck." Philae is currently parked on the head of the comet. Although the comet seems to be pretty stable right now, it's possible that it could break up as it flies closer to the sun. Comets are extremely unpredictable, and 67P/C-G is no exception, according to Rosetta project scientist Matt Taylor. "Ultimately, comets only have a limited amount of fuel and a limited lifetime," Taylor said during a webcast before the landing. "We hope and expect that the comet will live up to the end of next year, hopefully, but it may not, it may break up. We don't know. That's part of the mission itself, is to try and understand how a comet works." Philae, Rosetta and the landing site, Agilkia were all named in a similar, Egyptian theme. Rosetta is named after the Rosetta Stone, a tablet that helped archaeologists translate ancient Egyptian hieroglyphics. Philae is named for an obelisk found on an island of the same name in the Nile River, and Agilkia is named for another island in the Nile. Editor's Note: This story was updated to reflect a correction at 11:43 a.m. EST (1643 GMT). Scientists are not yet sure whether the lander's harpoons deployed.